The history of Maison Lecompte begins in 1923, when a local wine and spirit merchant decided to sell the rest of his company but hold onto his collection of vintage Calvados. 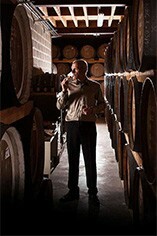 He then devoted himself entirely to the aging, blending and promotion of Calvados. Maison Lecompte was born. There, in the peaceful cellars of his farm at Notre Dame de Courson, he laid down these casks of precious Calvados to continue their slow alchemical evolution in peace. And there they stayed for decades, entirely forgotten. 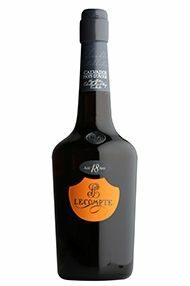 Eighty-five years later the owners of Maison Lecompte asked Richard Prével, a third-generation Cellar Master, to create the most extraordinary, the most perfect and the most complete Calvados ever made. The Cellar Master spent five years blending, researching, composing countless combinations of Lecompte’s precious eaux-de-vie in a tireless quest for perfection. As he searched the cellars for the rarest vintages to be used in this special blend, he came across several barrels which had been forgotten since 1923 – the barrels with which Maison Lecompte was founded. 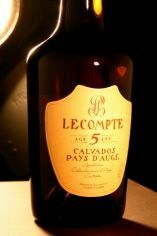 Lecompte 5 Year Old Calvados combines the fruity character a young Calvados with the subtle, delicate vanilla oak notes from the new, lightly toasted casks it was first aged in. This Pays d'Auge Calvados is further matured in older casks (aka russet barrels) to allow the fruitiness to unfold and develop.